Sam Shrouder, one of the directors of Wychwood Festival, must have one of the best jobs at the festival! He gets to compere the main stage, which means he introduces all the acts and comes on stage in between acts to say "Happy Birthday to Millie" and "Congratulations to Fred and Wilma on getting married. Not here and now, but recently!" 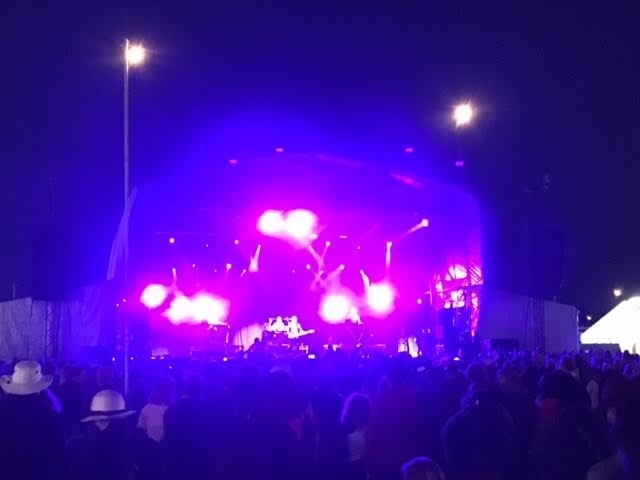 So, on Saturday 3rd June 2017, when the thirteenth annual Wychwood Festival was in full swing, Sam was backstage, looking after the bands and keeping an eye on the weather! 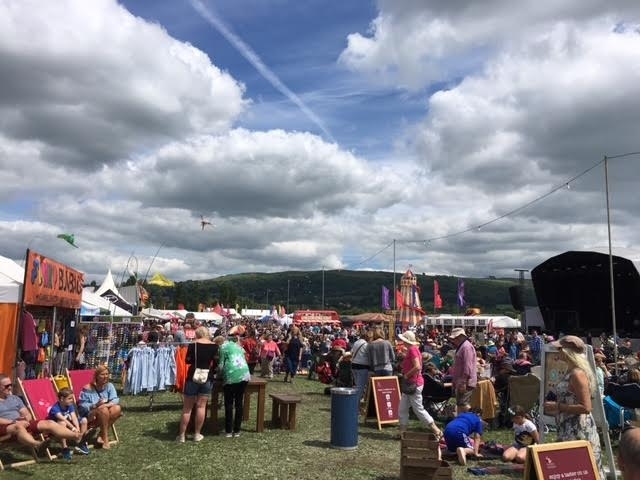 As it happens, despite the arrival of several very black clouds throughout the day, no rain appeared, which was good news for the 5,000 festival goers out front enjoying a huge range of activities and music. Over the weekend, there were over 100 bands and 100 workshops, so as we had Saturday tickets, we had a vast choice of options! We caught several of the acts on the main stage. Harpers Ferry were a lively Gloucestershire band and did a good job at entertaining us whilst we ate our early lunch! The East Pointers were a trio from Canada playing banjo, violin and great array of foot stomping Celtic vibes. They had recently learned a traditional Orkney song when up at the Orkney Festival which went down well. 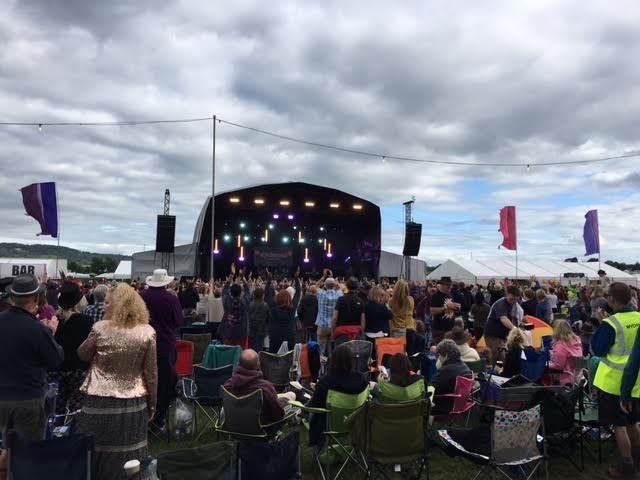 There is so much to do at Wychwood Festival that on our way to find George Montague, Cheltenham singer-songwriter that we wanted to see, we found ourselves distracted by the stand-up poetry "spoken word cabaret" in the Seaside tent, which kept up entertained for a while. George Montague is definitely a showman, and he soon had everyone in the Hobgoblin tent joining in with his "oh oh ohhh oh" backing vocals. 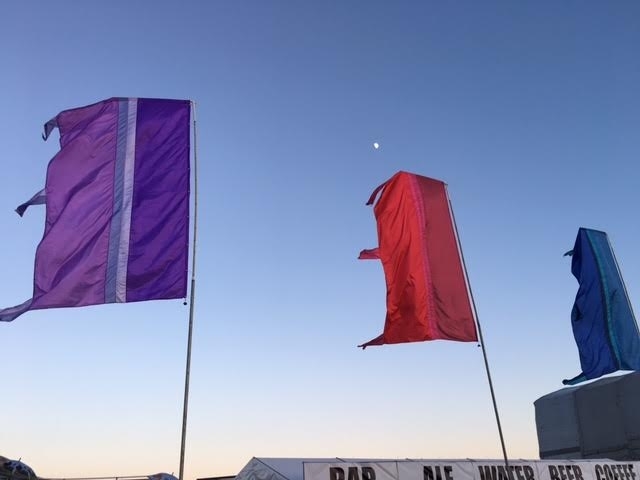 There were so many families and children joining in with the vast selection of workshops, crafts and circus skills going on in the Forest, Hillside, Seaside Outside, Kids Literature and other Marquees that it was a joy to see. Wychwood certainly feels like a relaxed and safe festival and one of the best things to do is to watch the people go by. All sorts of fabulous outfits and hats and this year, lots of sparkly facepaint and glitter to admire! We caught up with some local artists on the buskers stage, as well as a highly popular entertainer doing all sorts with balloons! The Ukulele for Beginners was a workshop we headed for. It seems that Matt King and his ukulele teaching is legendary as the tent was standing room only with around 50 people of all ages learning chords and then strumming away in unison. 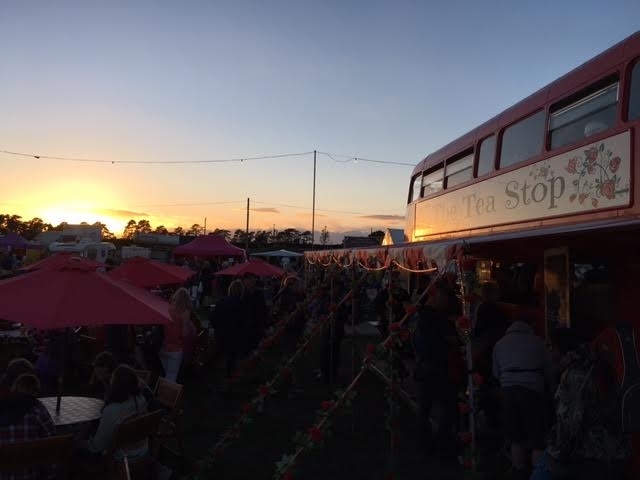 There are many food stalls serving fabulous looking foods from around the world, as well as a double decker bus serving tea, cake and scones. Somehow, the cream tea with strawberries that our neighbours were eating, seemed very civilised, so we told them so and they replied with "That's because we are civilised people!" and we all laughed. Having threatened rain all day, the skies cleared as the fabulous Dhol Foundation played the Main Stage in bright sunshine. Their infectious drum beats and cultural fusion of music had the crowd up on their feet, even before they brought on their bhangra dancers and vocalist. The dancers lead everyone in the moves meaning much of the audience were dancing in sync, which was a powerful moment. Another highlight was when the fiddle player took centre stage with the harpist-come-Irish-dancer to give a real fusion of Irish and Asian music. So, the sun set and OMD came out to play, all dressed in black with lots of dramatic lighting. They showed their intent for the evening by starting with Enola Gay, so everyone was up on their feet straight away. There were some good gags and banter between Andy McClusky and Paul Humphreys, with Donald Trump being mentioned more than once. Andy mentioned their first single being released 37 years ago this summer and then later said "This one is for you younger ones in the audience... It was released in 1991!" The biggest cheer of the night came when he said "I apologise! We aren't going to play any arty music for you this evening. Just singles. You guys are all drunk in a field and we are just going to play the stuff you know!" That is what OMD did, finishing off with the high tempo Electricity and leaving the crowd wanting. As we walked back to the car, our compere Sam reappeared saying "That's all from this stage tonight, but there's lots more on the other stages and with the Headphone Disco and bars open til 3am." Thanks Sam and thank you Wychwood. A really great way to spend a summer Saturday!